Giuseppe Tominz, Jožef Jakob Tominz, (6 July 1790 – 22 April 1866) was an Slovene painter, who lived and worked in the Austrian Empire and in Italy. He was one of the most prominent Italian portraitists of the Biedermeier period. He became renowned for his realistic portraits,. He worked mostly in the Austrian Littoral, but also produced religious paintings in Carniola and in Croatia. His handiwork can be seen in the Holy Mary Church in Stoliv. Nowadays, many of his works are on display in the Revoltella Museum in Trieste, some in the National Gallery of Slovenia in Ljubljana, National Museum of Serbia and in the Museum of History and Art of Gorizia. 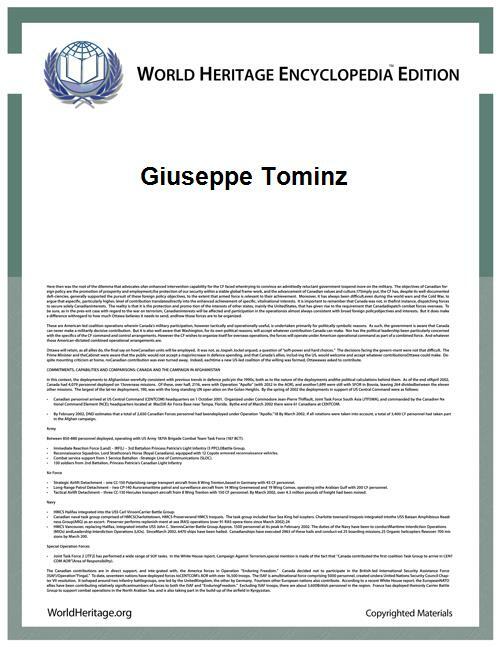 Giuseppe Tominz was born in Gorizia as the second of eleven children of Ivan Tominz, an ironmonger, and his wife Maria Anna Giacchini. He was educated in an Italian-speaking environment. He attended a primary school run by Piarists in Gorizia, where he began to learn to paint in the third year. He received his first training as a painter from the local artist Karel Keber and probably also from the painter Franz Caucig. In 1809, he left for Rome with the help of Austrian Archduchess Maria Anna, sister of Emperor Francis I of Austria, and count Francesco della Torre. In Rome, he studied painting with Domenico Conti Bizzani and in the Scuola del Nudo at the Accademia di San Luca. In 1814, he was awarded a silver medal for his drawing Study of the Apostople. Two years later, he married Maria Ricci and in 1818, have two son Augusto and Alfredo will become the first director of the museum Revoltella. In the same year, Tominz returned with his family to Gorizia. Of his early artistic works, several anatomical studies, sketches and one of his landscapes View of Vietri, Rieti and the Salerno Bay have survived. In 1819, Tominz lived for some time in Vienna. From 1821 to 1823, he lived occasionally in Ljubljana, where he exhibited his works and painted portraits of nobles, members of the bourgeoisie, religious dignitaries and participants at the Congress of Laibach. Between 1830 and 1855, he lived and worked in Trieste. He later moved back to Gorizia, and finally to his estate in Gradišče nad Prvačino, where he died in 1866. Tominz's early works include portraits of members of the nobility and bourgeoisie, but also of simple people. His influence can be seen in the works of the Slovene painters Matevž Langus and Mihael Stroj. The style of Tominz’s portraits was influenced by late Classicism and by the style of Viennese portrait artists of the Biedermeier period. The people in his portraits have sharp features and clear forms, but despite this the depictions are realistic, sometimes with an ironic touch. The backgrounds are filled with landscapes or the city from which the person depicted originated. Tominc also included objects that hint at the profession or the lifestyle of the person depicted. Inspired by Jean Auguste Dominique Ingres or Vincenzo Camuccini, he used cool colours and plastic models of people. He is however best known for his oil painting technique, his precise skills of observation and his rapid style. When depicting religious motives, Tominc relied on graphical templates, the old Italian masters and Nazarene painters. Amongst his numerous sacred works are altars and other pictures for churches in Gorizia, Prvačina, Aquileia, Kanal ob Soči, Gradisca d'Isonzo, and elsewhere. Remigio Marini, "Giuseppe Tominz", Firenze, 1950. Simona Rinaldi, "Giuseppe Tominz a Roma : metodi esecutivi nei dipinti dell'Ottocento", Firenze, 2010. Nicoletta Bressan, Barbara Jaki, Susanna Gregorats, Jožef Tominc: Fiziognomija slike. Ljubljana, 2002. Enciklopedija Slovenije, s.v. "Bidermajer" in "Jožef Tominc". Slovenski biografski leksikon, s.v. "Jožef Tominc". Barbara Jaki, Meščanska slika : Slikarstvo prve polovice 19. stoletja iz zbirk Narodne galerije. Ljubljana, 2000. Ivan Sedej, Sto znanih slovenskih umetniških slik. Ljubljana, 1985.